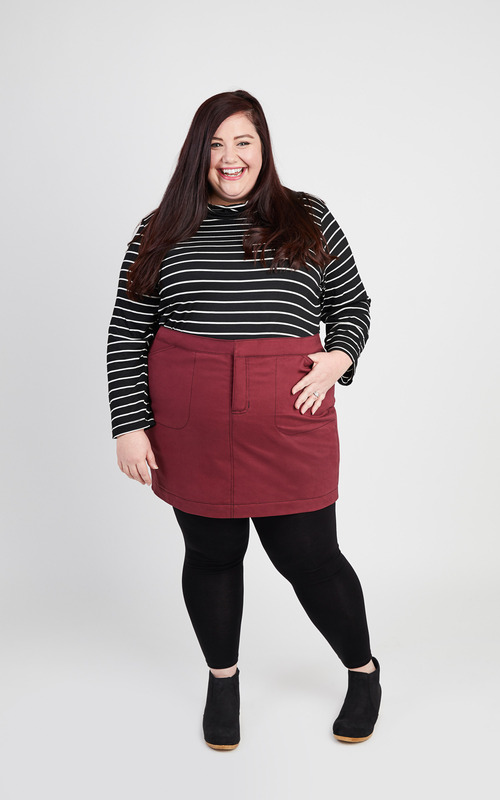 Introducing the Cashmerette Ellis Skirt! 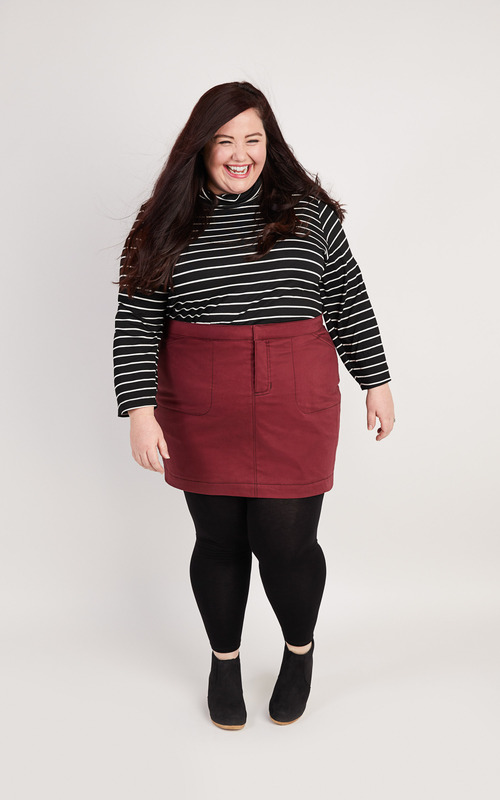 You asked for a skirt, and we answered your call! 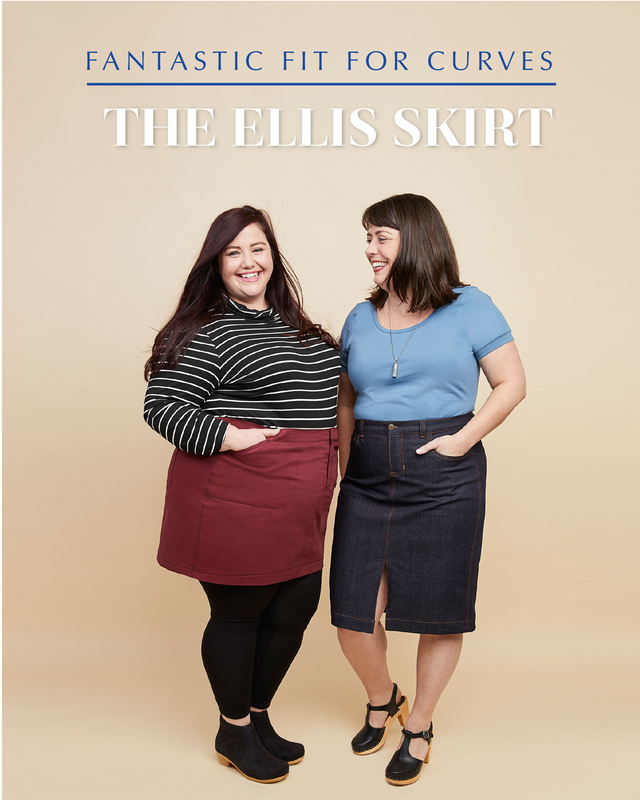 Today I’m excited to share the first ever curvy & plus size skirt sewing pattern from Cashmerette: the Ellis Skirt. 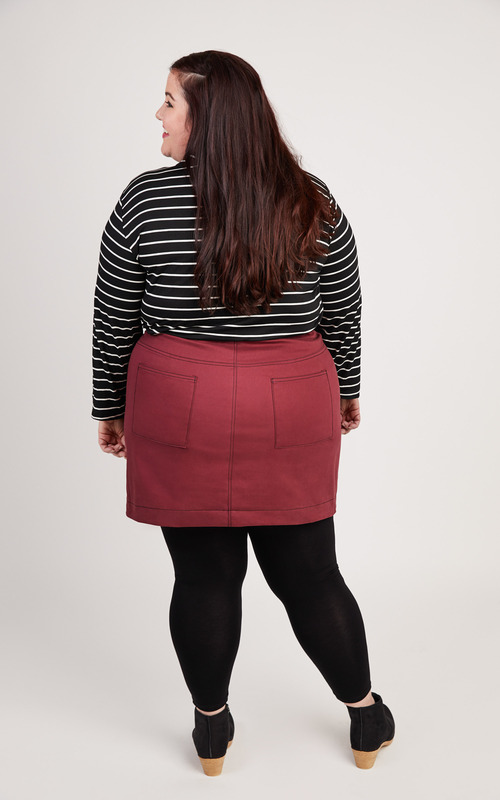 For our debut skirt we wanted to combine the fit and style that you’ve come to love from Cashmerette Patterns, so there are two awesome views, together with a bunch of curve-friendly fit features. 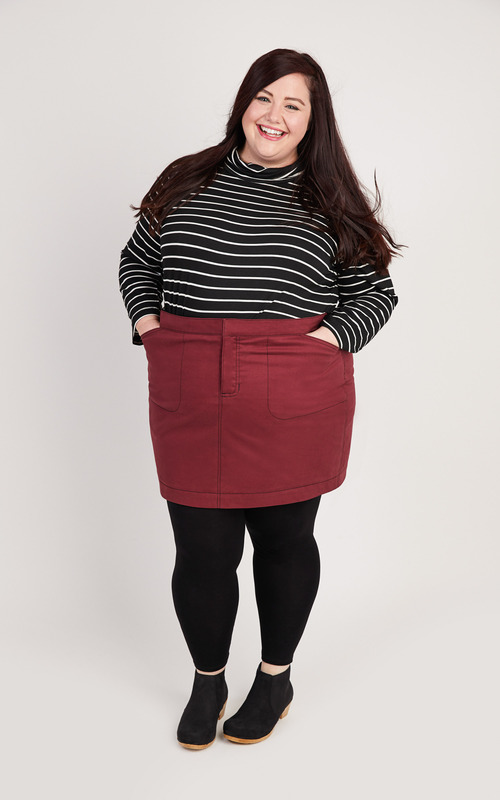 You can pick from a classic 5-pocket denim skirt or a flirty miniskirt, and for a fab fit, look no further than our two “apple” and “pelvis” options, so wherever your curves are located, the skirt will fit and skim in all the right places! Add in shaped seams, back darts, a sculpted yoke and waistband, and a full front pocket stay, and the Ellis will give you the fit you’ve been dreaming of. 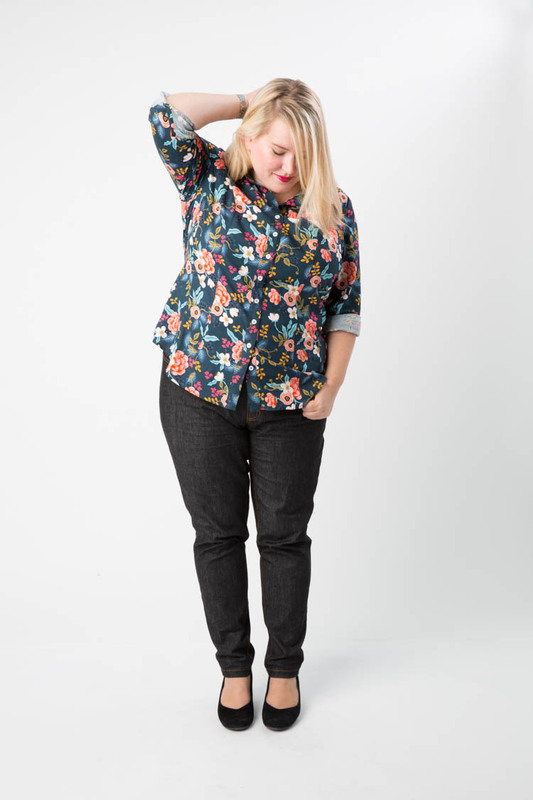 Plus, we have Ellis Skirt denim kits for you! Scroll down for more….. 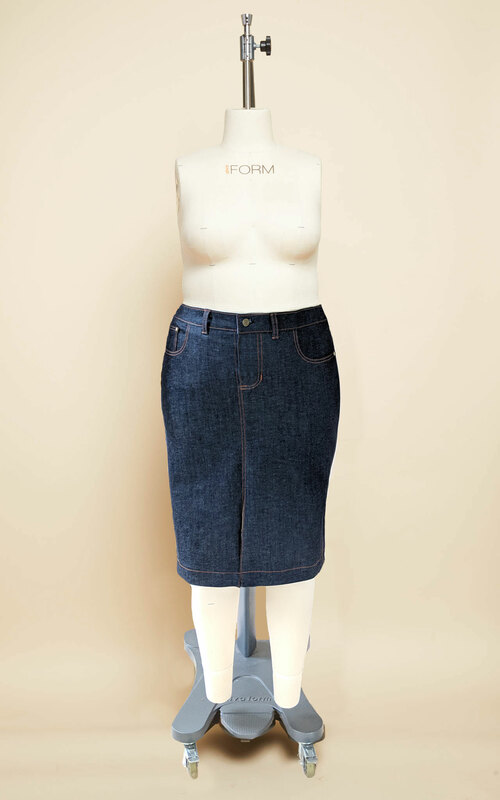 The Ellis Skirt has two views, both designed for stretch wovens like stretch denim, twill or even corduroy. Using firm stretch wovens means you get a sleek silhouette but there’s still room to expand when you sit down, like we all do! No uncomfortable waistbands digging in with Cashmerette. We developed the Ellis Skirt with two options for pelvis shape, in the same way as the Ames Jeans. For either view, you can pick the “apple” or “pear” pelvis pieces to use. What does that mean? You have a straighter hip curve rather than a very curved one. You have a lower hip:waist ratio – under 10″ difference. Typically, you find waistbands gape at the back, but are tight through the hips. Conversely, when a garment fits you in the hips, the waistband is much too big. You have a very curved hipline. You have a higher hip:waist ratio – over 10″ difference. 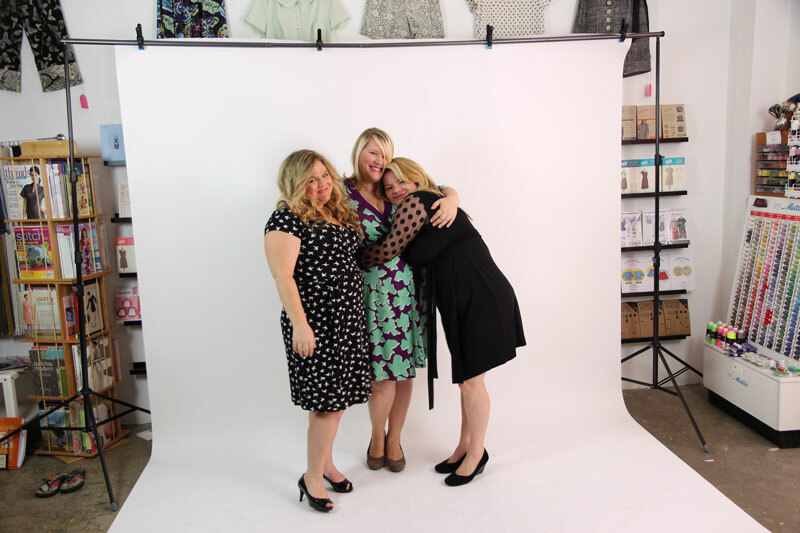 If you want to learn more about the fits, check out this blog post – and you can also always email us at hello@cashmerette.com for personal advice! 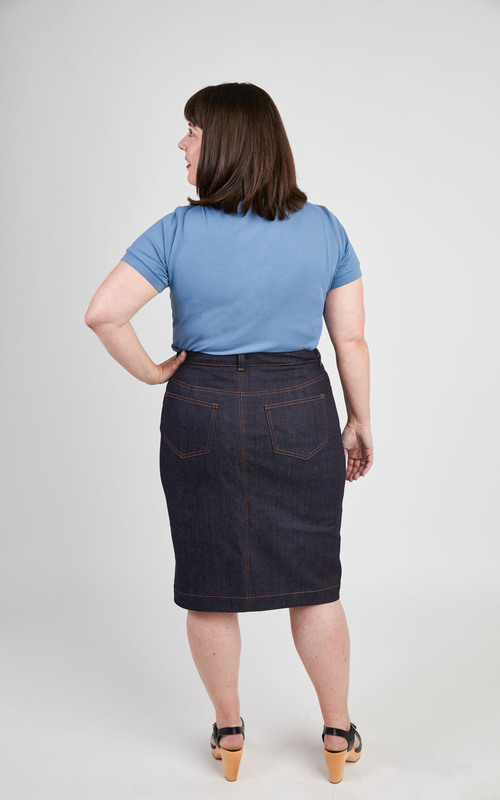 Our first view in the Ellis Skirt is designed with the iconic denim skirt features – although that doesn’t mean you have to use denim! Both views are fine with any medium- to heavy-weight stretch woven which has at least 15% stretch across the grain. Meg is wearing a size 16, apple fit in view A (and paired with a Concord T-Shirt). She has a 38″ waist and a 46″ hip. Then our second view of the Ellis Skirt is a mini-skirt! Whether you go bare-legged in the summer, or pair it with opaque tights or leggings in the winter, it’s a modern, fun style. Michelle is wearing a size 28, apple fit in view B (paired with a Pembroke Tunic turtleneck). She has a 48″ waist and a 58″ hip. Ayelet is wearing a size 12, pear fit in view B (with a Concord T-Shirt). She has a 32″ waist and a 43″ hip. 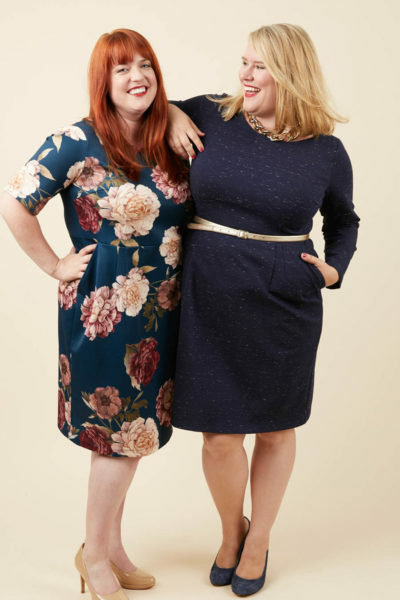 You can really dress the Ellis Skirt up or down, depending on what type of fabric you choose, and your other pieces. 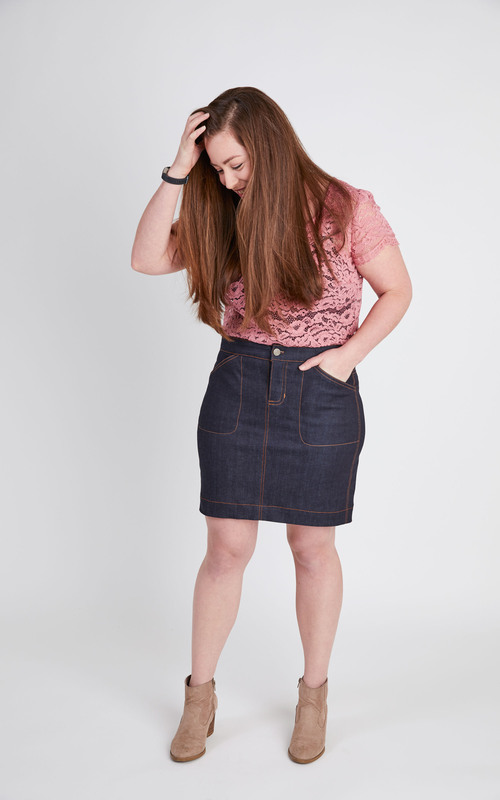 Here, Ayelet’s paired her Ellis Skirt with a gorgeous blush lace Montrose Top! 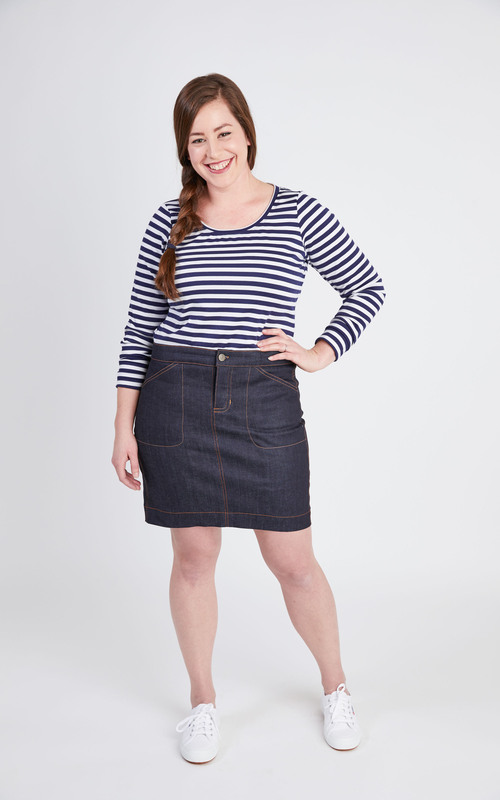 Like all our patterns, the Ellis Skirt comes in sizes 12 – 28, and the pattern is rated “intermediate” because of features like the fly-front zipper and jeans-style construction, but a confident advanced beginner could totally tackle this project with our top-reviewed instructions. 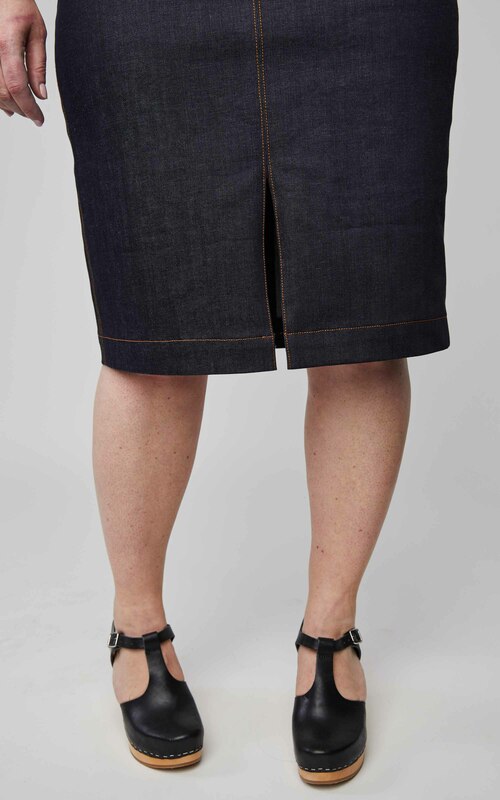 And we have Ellis Skirt denim kits! 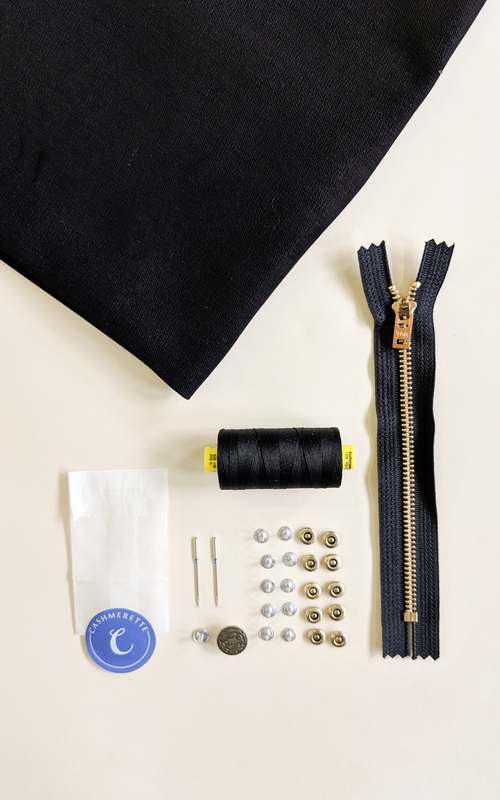 Sourcing high quality denim can be hard, so in addition to the pattern launch today, we have kits for you too! 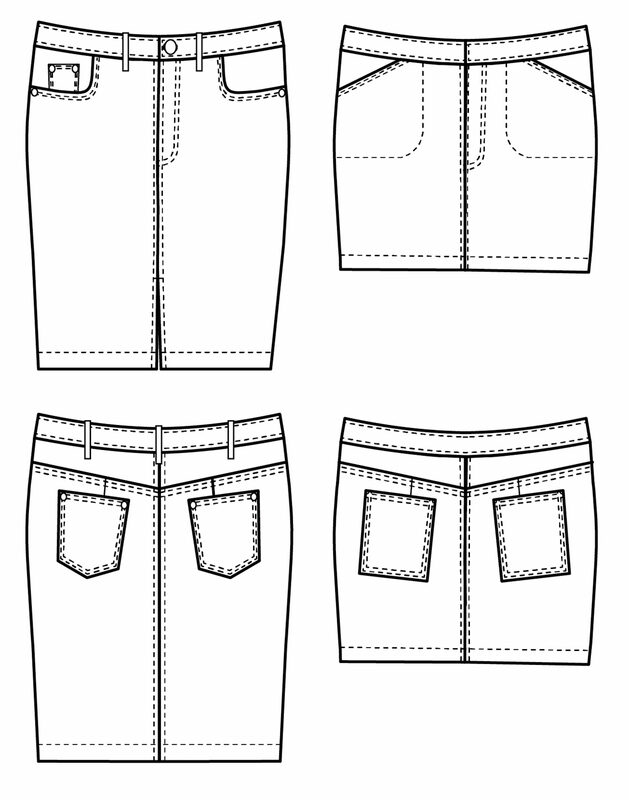 The kits contain the denim and notions you’ll need to make a classic denim-skirt style of either view, and you can choose whether to add a PDF or Printed pattern, or buy the fabric and notions alone. True Black! I’m so pleased we finally have an actual inky-black denim (not “very dark blue”), and I’m pleased to report that it washes fantastically. Sadly black denim doesn’t photograph so amazingly… you’ll have to trust me when I tell you it’s awesome in person! 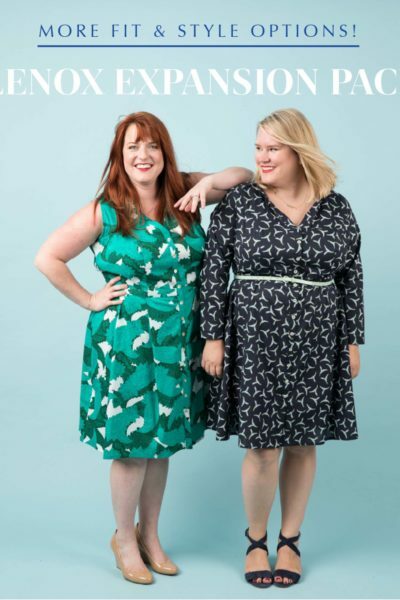 So that’s the Ellis Skirt, our first curvy & plus size skirt sewing pattern from Cashmerette! I hope you love it, and I’m looking forward to seeing what you make – be sure to use the hashtags #EllisSkirt and #Cashmerette when you post on social media so I can see your magnificent outfits!